Today is Climate Impact Day, set up to connect the dots between climate change and extreme weather, effects felt from diatoms to humanity. What is past is prologue, and I think of two years ago when we flew back from Iceland. 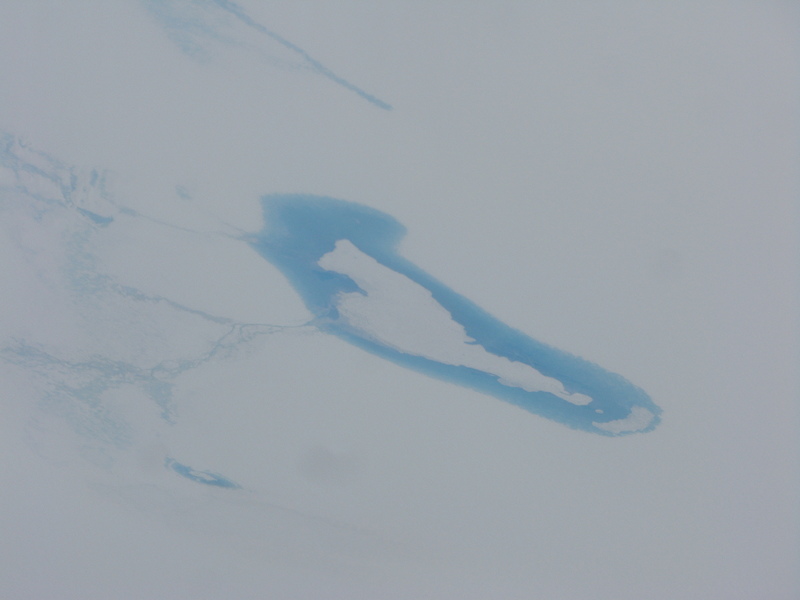 Our plane crossed over Greenland, and I took a few photographs through the jet’s window. It was a clear summer day and the view was absolutely breath-taking. The jet’s contrail, meanwhile, was adding its contribution to the atmospheric greenhouse that is melting that ice. There was a point, deep inland over the ice, where everything visible below was white. I wondered if we were flying upside-down, so cloud-like was the vista. But then there were these huge patches of blue. Recently, I stumbled upon Extreme Ice, a PBS Nova episode, which explained what was going on. These are lakes that form atop the ice mass during the summer melt season. They have a tendency to disappear very quickly, and for a while it was thought that the water just refroze. But actually, the water cuts its way into the ice, hydrofracking deep vertical channels, and draining deep down to the bedrock. 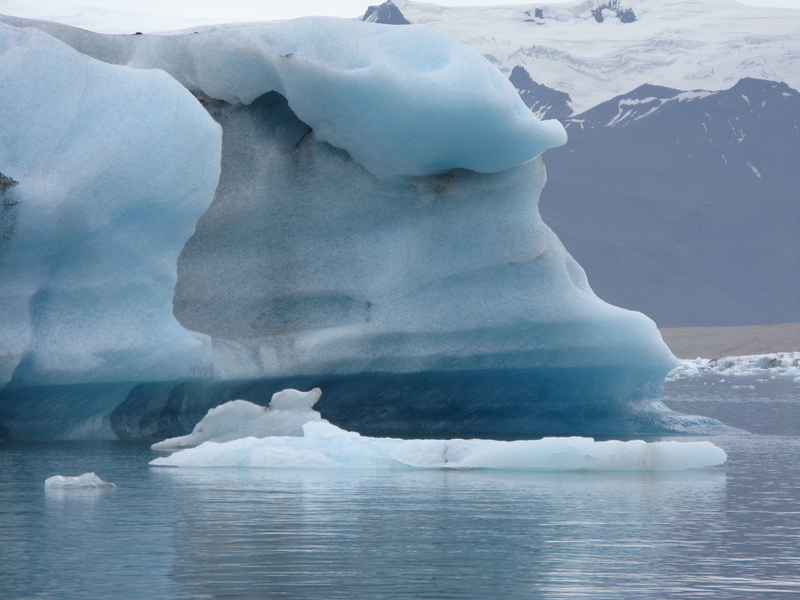 There the water acts as lubrication for the ice, making it move towards the coasts faster. Here are more details. There’s a feedback loop here, for the more the ice melts, the more it melts. 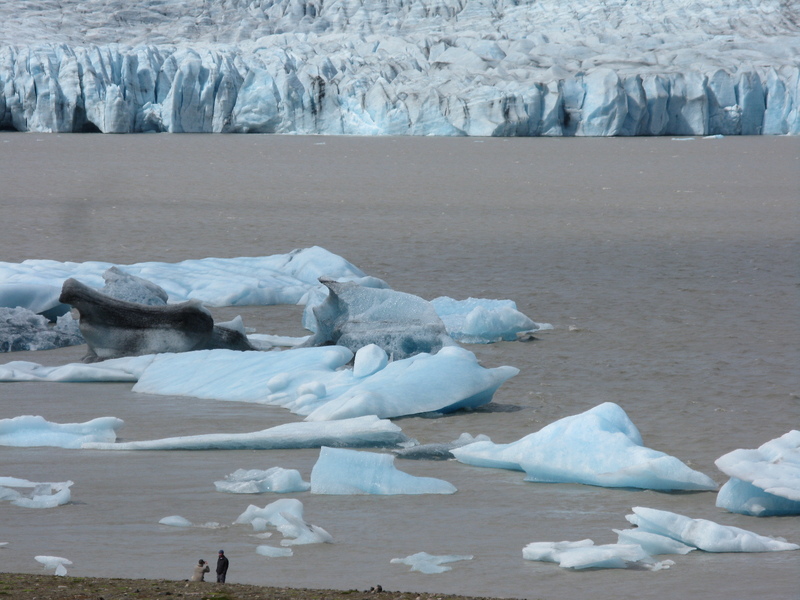 Similarly, water at the calving face of a glacier acts like water does on the road, expanding cracks, and makes calving, the shearing off of icebergs from the glacial face, happen more quickly. Think potholes three miles long, the width of Manhattan at its fattest. 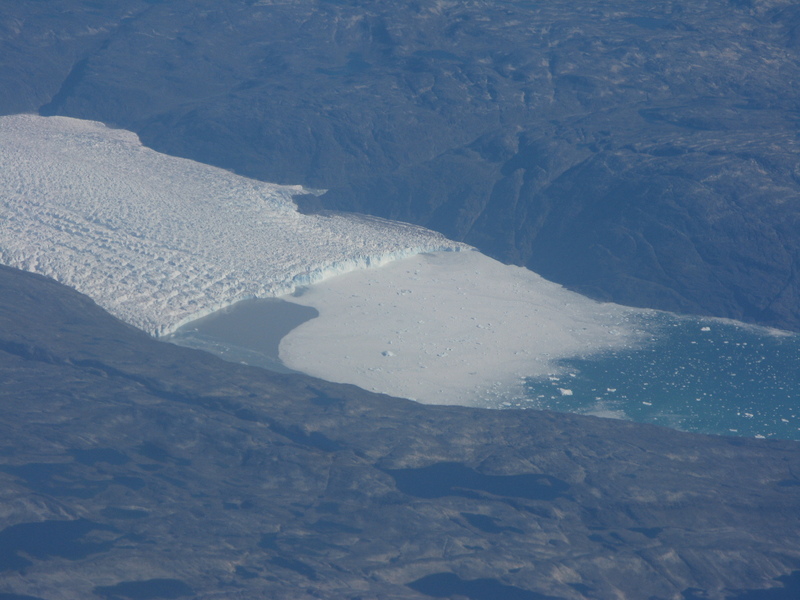 Meanwhile, warmer, denser sea water, below the face of the glacier, undermines it from below. The documentary follows a photographer to Alaska, Iceland, and Greenland, where the ice is all retreating much faster than it is being replenished by snowfall. The reason for this is that the amount of carbon dioxide (CO2) in the atmosphere is at record highs, and we know – regardless of what the stupid or willfully wrong say or try to obscure — that during the last 400,000 years this pattern has held true: high CO2 levels correspond to high temperatures which correspond to high sea levels. It’s simple, really: the atmosphere gets warmer because the heat radiating from the earth is trapped, like heat in a greenhouse, and the temperature rises. As the temperature rises, the oceans both expand because of the heat, and all the water pouring into them from the melting ice. Most of the world’s population lives on sea coasts. Meanwhile, as the ice melts, albedo lessens, which means there’s less reflection off of the white ice and more absorption by the dark earth; another factor heating things up. And as the ice goes so too goes the permafrost, which, in thawing, releases methane, an even more potent greenhouse gas than CO2. Sure, someday the ice will return, but so far in the future that it’s irrelevant to humanity. The relevancy is now and the short distance to your children’s children, who will live in a world without mountain glaciers. In a hundred years, the roof of the world, the Himalayas, will have lost its great ice cap. If a billion people depend on the melt-water from there now, what will they drink in a century? We already live in a world crowded with refugees, political instability, and conflict over resources. Global climate change is going to make these problems infinity worse. Many people say they “don’t believe” in either global warming, or, if they have any sense of nuance, anthropomorphic global warming. But it is not a question of belief. Belief is for the Tooth Fairy and Easter Bunny. This is a question of science. That some people don’t understand the difference is a both a failure of our education system and a moral crisis. I’m no partisan: the corporate moderate currently in the White House has shown little to no leadership on the issue of global warming. The fabled moderates he’s supposed to court evidently aren’t interested in the issue. We know that the Pentagon is thinking about the instability radical global climate change is causing, as are the insurance giants, so there can’t be any doubt Obama isn’t aware the issues. Of course, we’re silly to think that he or any President should be leading us. In fact, they are followers, of the money, which is shorthand for the power structures in our oligarchic kabuki democracy; and, on a day-to-day calculus, the facile polls. We need to lead, and to light fires behind the followers’ sorry asses. The effort to kill the Keystone Pipeline disaster was one such fire, but we need thousands more of them, since that’s already being undermined by Obama’s fast-tracking of the southern route. The ice calved off of into the Jökulsárlón lagoon in Iceland is pulled out a narrow channel by the tide into the North Atlantic. 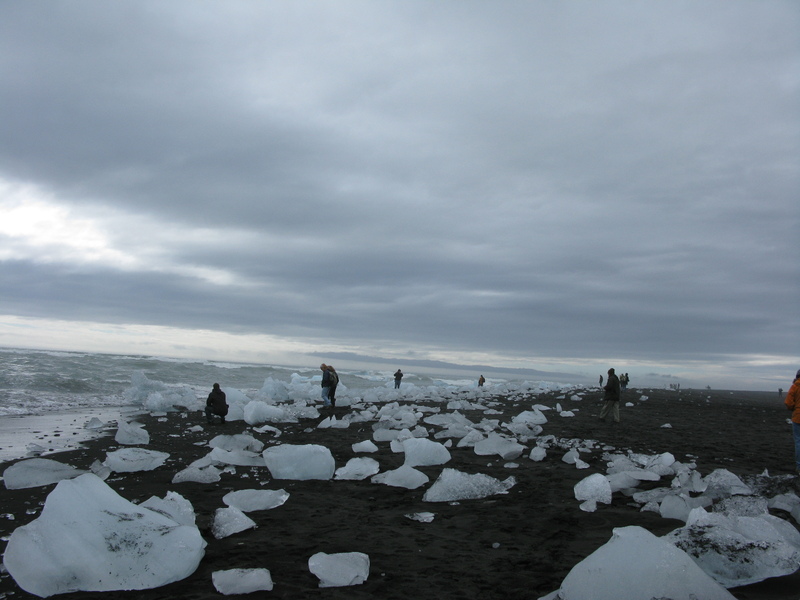 Then it is pushed back onto the black sand beach by the waves, and battered and whittled away by the water. Iceland should have really been named Greenland and Greenland really Iceland a millennium ago when the Norse steered their ships west. Although the Little Ice Age turned cold and grim in the north, for the last century and a half both these lands have been warming with the planet. Iceland is losing its ice. Greenland is finally turning green. The effects are like a three-dimensional game of dominoes. Sad, but true. It never pays to underestimate the stupidity of people. Such evildoers they are, wishing to save all the unborn to suffer the results of climate warming.